"As a former NFL player, national spokesperson for the Positive Coaching Alliance, and someone who has personally experienced the significant effects of a concussion, I believe every parent of a young athlete and coaches should be fully aware of the signs and symptoms of a concussion in a young athlete. To help them act and respond to this injury the right way, they need to have proper tools. 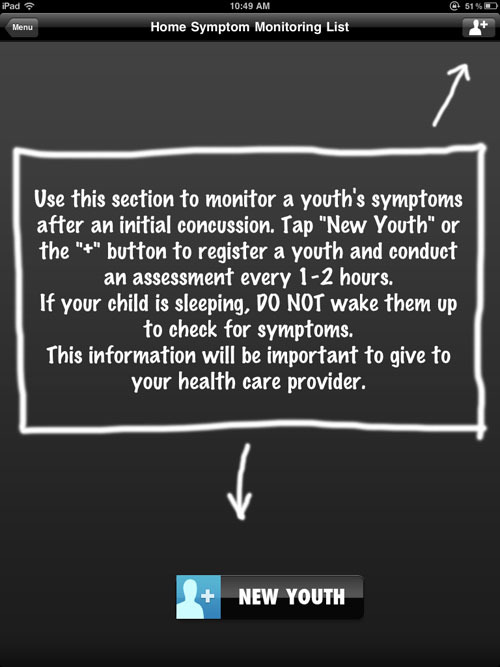 Based on the great CDC Heads Up work that Dr. Gioia helped to create, the Concussion Recognition & Response App gives parents and coaches a great tool to identify kids with suspected concussions. It also is a great resource of information about concussions and what parents can do to help their child recover from the injury. 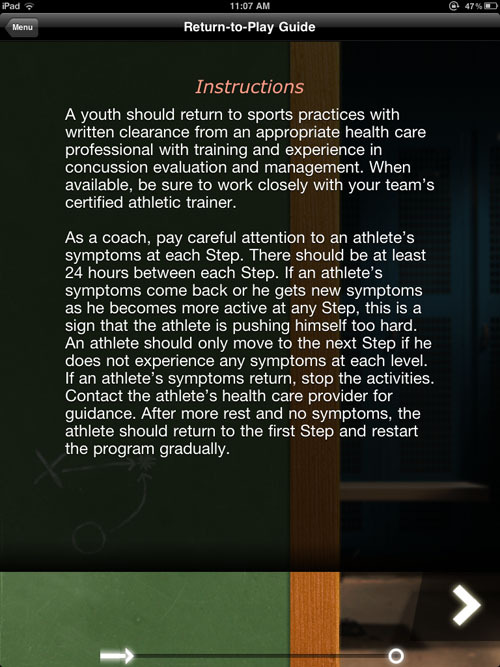 This app should be a necessary part of every comprehensive youth concussion management and awareness program." 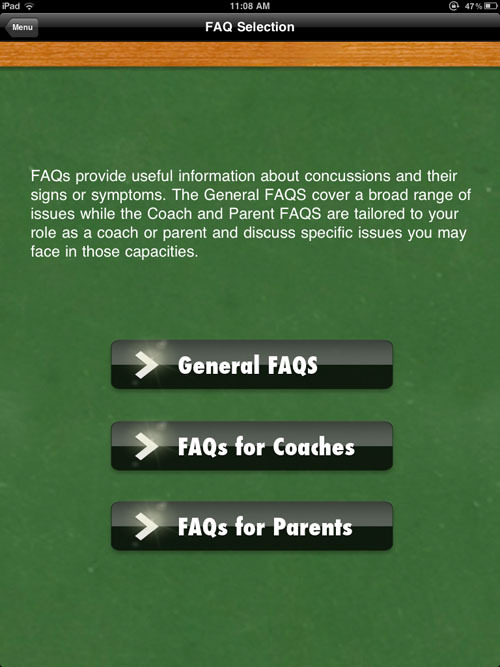 The CRR is a free application for a smartphone or tablet that helps coaches and parents recognize whether an individual is exhibiting the symptoms of a suspected concussion. Updated with a new look in 2016, the app allows a coach or parent to respond quickly and appropriately to this potentially serious medical situation. 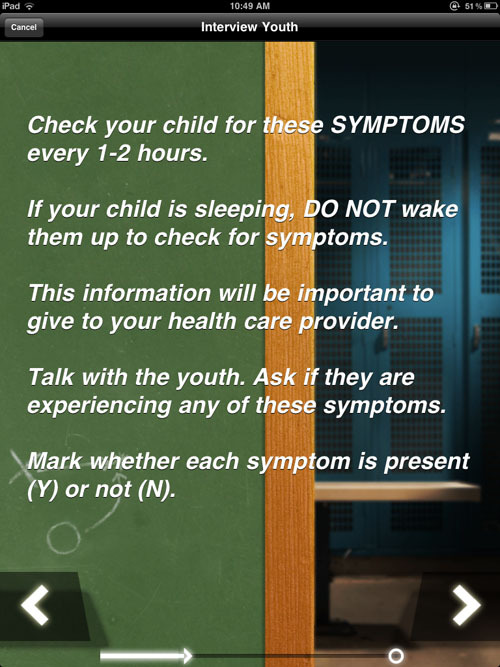 In less than 5 minutes, the user can complete a checklist of possible signs and symptoms to help decide whether to remove a child from play and determine the need for further examination. It also allows users to record pertinent information and share that information via e-mail with health care professionals. Includes sections pertaining to concussion recognition and response and home symptom monitoring and features a return-to-play guide, concussion information, and acute concussion evaluation (ACE) post-concussion home/school instructions. Concussion recognition. 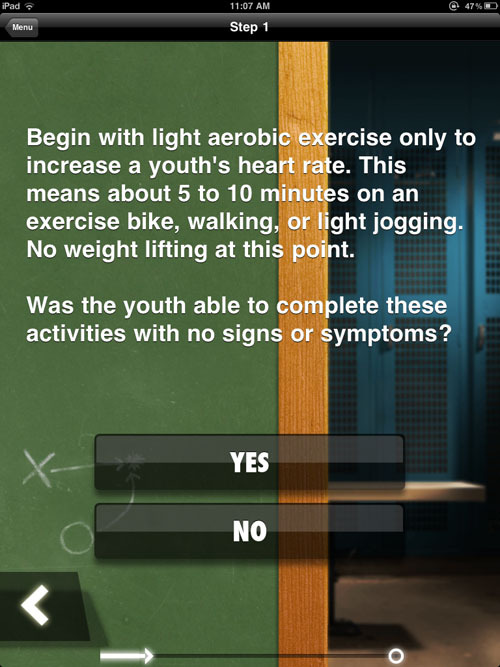 Using information from the CDC’s Heads Up: Concussion in Youth Sports program, the app guides users through a set of questions to determine the likelihood of a suspected concussion based on observations by the parent or coach as well as symptoms reported by the athlete. In addition to the child’s name, age, gender, and sport, the location of the injury is tracked by the device’s GPS, and its camera can be used to photograph the injury. Along with the answers to the guided questions, this information can be e-mailed to a health care provider to provide accurate documentation of the child’s condition at the time of the injury. Home symptom monitoring (HSM). [image 1, 2, 3] After following up with health care providers, the app allows a parent or caregiver to record a child’s symptoms through periodic evaluations, which are tracked in the hours, days, or weeks following an injury. The information compiled using the HSM can then be e-mailed to the health care professionals, providing an update on the child ’s recovery. Return-to-play guide. 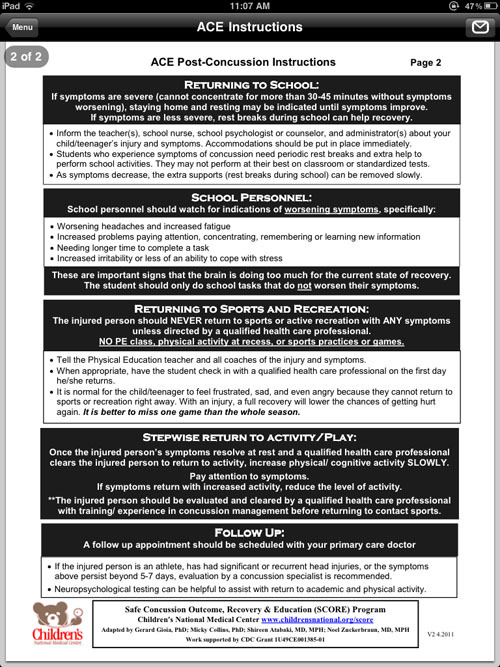 [image 1, 2, 3] Based on information from the CDC, the Return-to-Play Guide helps to protect children and athletes from further injury by guiding them through a daily exercise routine that assists in their ability to return to play. Through a five-step, tiered workout routine and in collaboration with the child’s health care provider, parents and coaches can ensure that the child is able to handle additional exercise without further injury or discomfort. Concussion information. 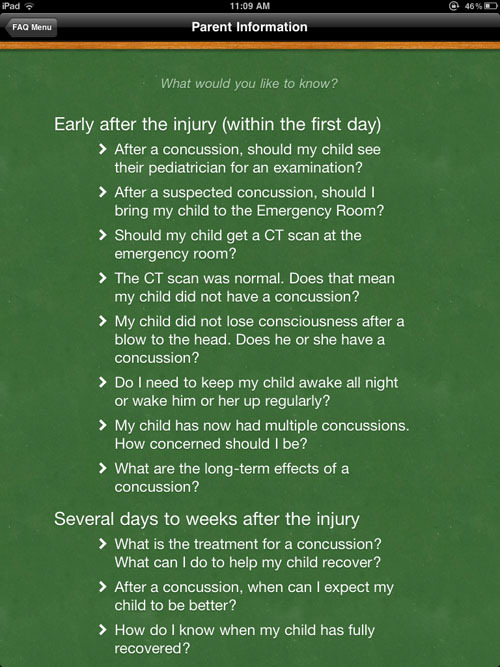 [image 1, 2, 3, 4] The app’s concussion information section helps coaches and parents to make an informed decision regarding how to proceed after a child’s injury. 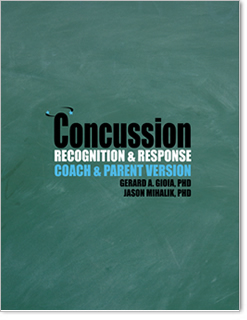 Provided by authors Gerard A. Gioia and Jason Mihalik, concussion specialists from the Children’s National Medical Center and the Matthew A. Gfeller Sport-Related Traumatic Brain Injury Research Center, this feature includes answers to Frequently Asked Questions for coaches and parents. 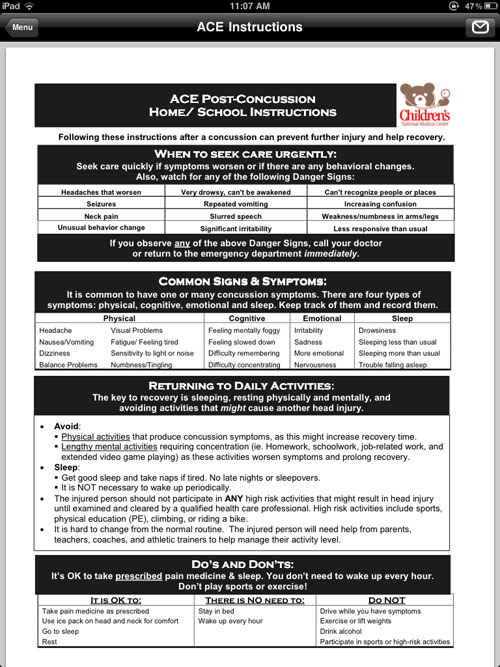 Acute Concussion Evaluation (ACE) Post-Concussion Home/School Instructions. 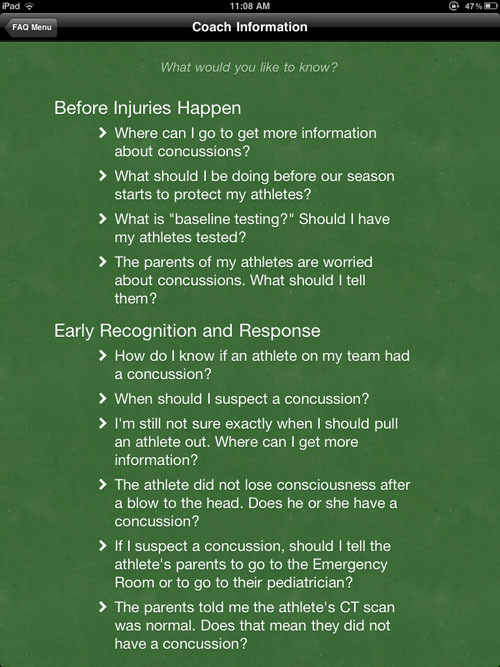 [image 1, 2] Included with the app is a concussion overview page that users can share with other coaches, parents, or athletes. This overview, which can be sent directly from the mobile device via e-mail, is an excellent way to share important information about how to recognize and respond to head injuries. The app is available at the Apple® App Store and Google Play™. 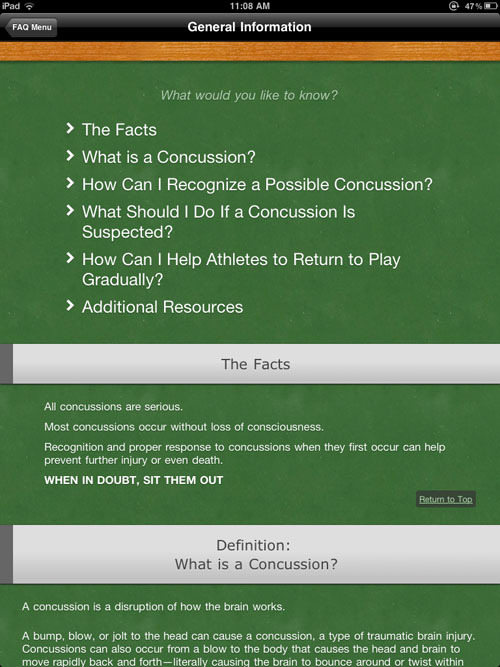 Download the Concussion Recognition & Response app today! 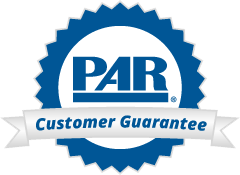 For your iPhone®, iPad®, iPod® Touch, or Android™ device or tablet. Requirements: iOS version 4.0 or higher on your iPod Touch, iPhone, or iPad or Android Version 2.2 or higher on your Android-based device.